In the November 8 election, Clark County voters decided to continue Fuel Revenue Indexing for an additional 10 years. Costing the average driver up to a quarter a day through 2026, this extension will generate up to $3 billion in revenue for hundreds of roadway projects, create jobs, reduce congestion and improve safety. Fuel revenue indexing helps covers the growing gap in funding to improve, maintain and expand our roads, improve safety, reduce traffic congestion and enhance connectivity. For more information about Fuel Revenue Indexing, visit rtcsnv.com/fri. You may have seen a new median that includes high-tension cable barriers along Summerlin Parkway. The barriers serve an important purpose: to keep out-of-control vehicles from crossing over the median and into oncoming traffic, which often results in death or serious injury. This new safety rail is designed to help prevent this from happening. Work on the $2 million cable barrier project started in June and is nearly complete. Phase two of the Summerlin Parkway Project began on Dec. 4 and continues through July 2017 to improve traffic flow at the Durango Drive and Rampart Boulevard exits. This phase includes construction of a new westbound auxiliary lane between Durango Drive and Rampart Boulevard and an extension of the HOV lane. The project will also include traffic signal modifications at Rampart Boulevard, ramp lighting upgrades, new overhead signage, trail improvements to connect Angel Park Trail to the Bonanza Trail, and storm drainage enhancements. The HOV flyover bridge will be closed from U.S. 95 to Summerlin Parkway to the end of January 2017. This closure allows work for the extension on the westbound HOV lane. During this time, the northbound Buffalo Drive to westbound Summerlin Parkway loop on-ramp is also closed through the end of January 2017, with traffic detoured to Vegas Drive and Rampart Boulevard. For more information, visit the City of Las Vegas website or call 702-353-4355. Your feedback is needed to shape the future of transportation! 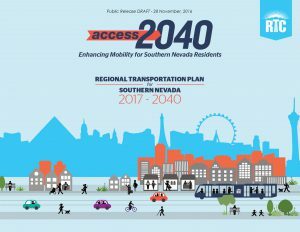 The Regional Transportation Commission of Southern Nevada (RTC) is working on Access 2040, the long-term Regional Transportation Plan, and needs your input. The comprehensive, federal plan for the region’s transportation system prioritizes needs and future projects to enhance connectivity, increase safety and ensure mobility for the valley’s residents and visitors. 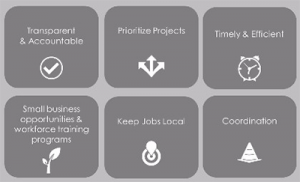 Access 2040 outlines a new process for transportation project selection and criteria for local governments to follow based on a unified vision for Southern Nevada. Public comments will be accepted until 5 p.m. Thursday, Jan. 12. Access 2040 is available for review online at rtcsnv.com/rtp. The Nevada Department of Transportation (NDOT) recently unveiled a new four-lane Western Avenue extension that connects with Charleston Boulevard and Grand Central Parkway. Western Avenue previously dead ended at Holsum Design Center, just south of Charleston Boulevard. The newly completed link improves mobility by creating another north-south connection for crosstown traffic, thereby relieving congestion and improving downtown Las Vegas access. The extension is part of Project Neon – a nearly $1 billion 3.7-mile-long widening of Interstate 15 from the U.S. 95 interchange to Sahara Avenue that broke ground earlier this the year. When complete, project Neon will improve safety, reduce congestion and create better access to downtown Las Vegas. For up-to-date Project Neon information, visit the project website at NDOTProjectNeon.com or call 702-293-NEON (6366). The entire project will improve traffic flow to and from the airport and is expected to be finished in the fall of 2017. For up-to-date information about this project and expected closures, visit ClarkCountyNV.gov. Roadwork is underway on Las Vegas Boulevard from Carey Avenue to Craig Road as part of a $17 million repaving project. Improvements include ADA upgrades and new concrete bus lanes. Drivers should expect a 24-hour lane closure in both directions from Nellis Boulevard to Craig Road for the next several weeks. This roadway improvements project is expected to be completed by January 2018. Clark County will begin construction of a concrete bridge on the CC-215 over Grand Montecito Parkway carrying traffic eastbound. This $9 million project will improve traffic flow and also includes roadway repaving, street lighting and signage. This project is expected to be completed by March 2017. The City of North Las Vegas has begun construction on an $8.8 million storm drain project to improve safety for drivers and pedestrians. Construction includes the installation of flood improvements on North 5th Street from Ann Road to El Campo Grande. Other improvements include roadway repaving, striping and signage. This project is expected to be completed by September 2017. The City of Henderson will begin work on a roadway repaving project in the residential community of Paradise Hills. The project also includes the installation of ADA compliant sidewalk ramps, striping, signage and pavement markings. Due to the required temperatures for roadway repaving, the contractor will start work in March 2017. This project will improve safety for motorists and pedestrians. The City of Las Vegas will soon begin construction on the Washington Storm Drain project from Martin Luther King Boulevard to Rancho Drive. The project includes the installation of box culverts for flood improvements, curb and gutter and sidewalk and striping. This $10 million safety improvements project will begin in March 2017. Clark County will begin roadway improvements on Eastern Avenue from Wigwam Parkway to Warm Springs Road and Serene Avenue to the I-215 beltway. Work will include roadway repaving throughout project limits and removal of failed pavement sections. Work also includes the installation of upgraded ADA ramps, new pavement markings and curb and gutter. This $3.2 million safety improvements project will begin in early spring 2017.